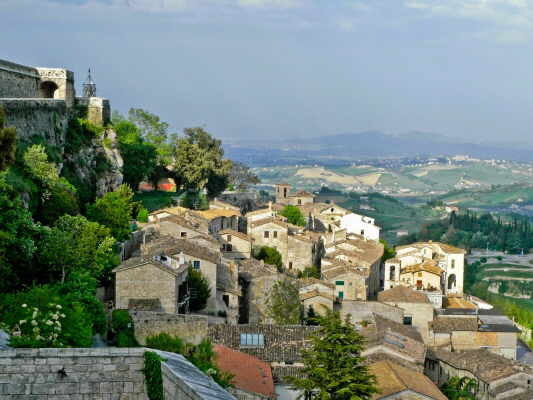 The region of Abruzzo is one of Italy’s lesser know gems and is seldom visited by British tourists. 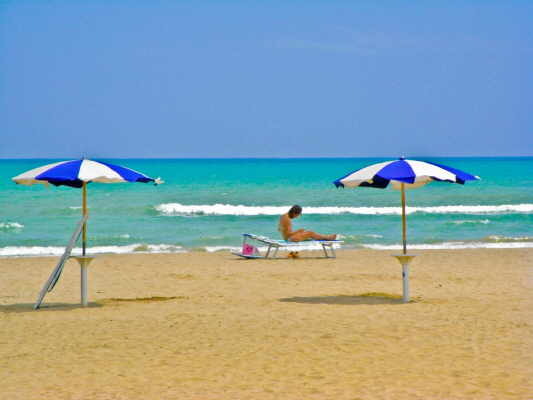 Indeed its miles and miles of sandy beaches cater for Italians, but English is seldom heard or spoken, even though there are direct flights from London’s Stansted to Pescara. That’s part of its charm and you almost feel you’re travelling incognito as they still haven’t woken up to the idea that they can hassle British holidaymakers. And where else can you ski in the morning and swim in the afternoon? 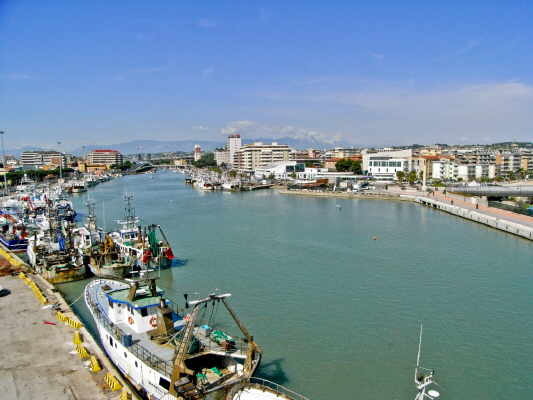 Pescara is Abruzzo’s largest city but it’s not overwhelming. Most of it was flattened by bombing at the end of the war, and its historic heart is limited to a couple of streets. 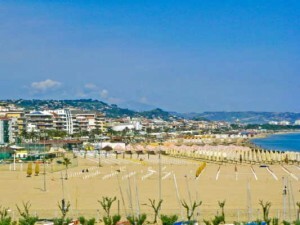 The modern town is a lively place, however, and there are miles and miles of sandy beaches, laid out in the Italian fashion with sun loungers and umbrellas. The promenade is dotted with ice cream parlours and pizza joints and, in the evening, the Glitterati pack the pedestrianised Corso Umberto. The better beaches are to be found out of town and are all easily accessible by the local train service. My favourite is Pineto where a strip of Pines separates the sea from the town and a Martello tower watches over the Adriatic. 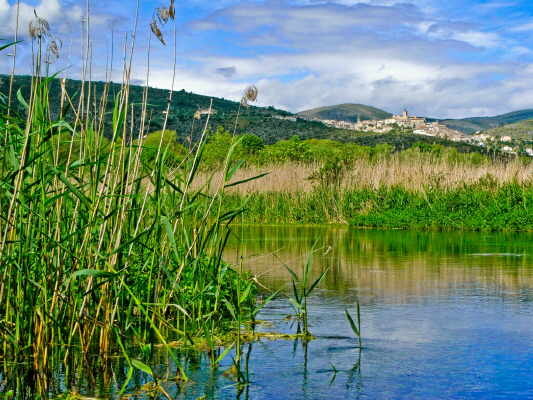 Abruzzo is Italy’s greenest region. The vineyards on the coastal plain quickly give way to mountains scoured by long deep valleys with fortified villages clinging to the hill tops. 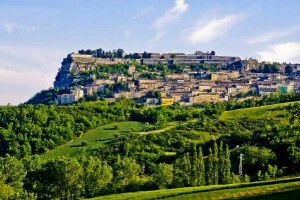 One of the most striking is Civitella del Tronto, just 30 km from the coast but already at an altitude of 600m. This medieval and renaissance village is perfectly preserved and is topped by the largest fortress in Italy, the last place to fall before reunification in 1861. From here there are spectacular views to the coast in one direction and the Gran Sasso mountains in the other. Mercifully, cars are banned from the village, and you can explore the architectural treasures of its narrow streets in peace. Another hill top village has treasures of its own. 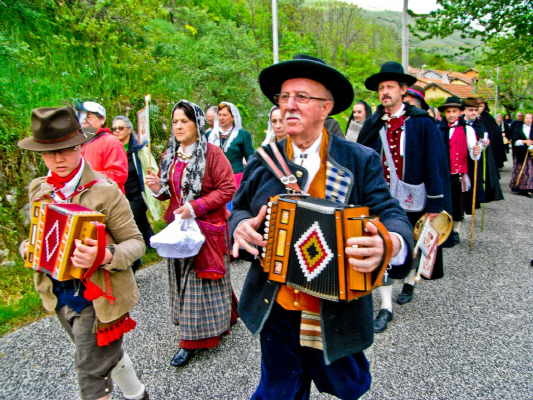 Cucullo’s church houses a statue of Saint Domenic and in May every year it’s taken out and paraded around the village. Apparently, in the 11th century, Dominic cleared the region of poisonous snakes so, to celebrate the event, the locals go out beforehand to catch hundreds of the non-poisonous variety. 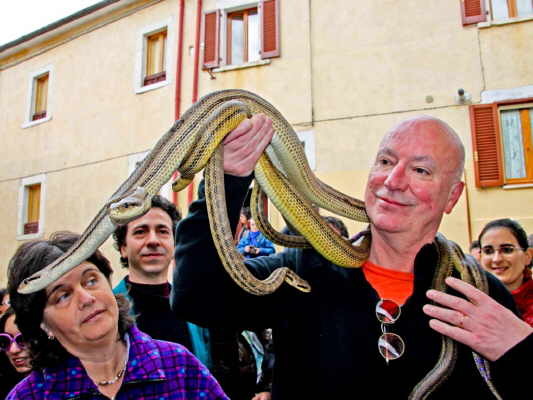 Pilgrims come from all over Italy to be blessed and the snake catchers oblige by draping a handful over their shoulders, before dumping the whole lot over the statue. 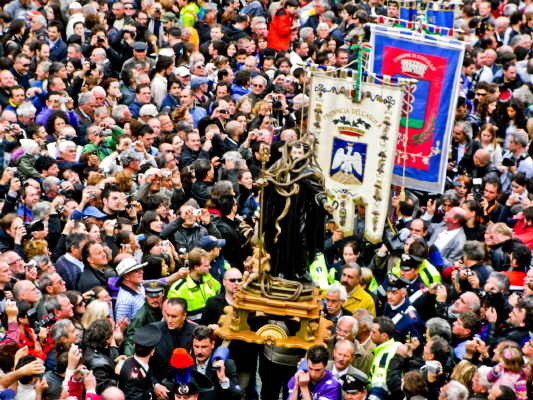 Even then, most of them fall off during the procession, and you have to be careful where you tread. The region’s wildlife is not just limited to snakes. The four national parks are home to a variety of species including bears, wildcats and wolves. They also offer a variety of activities including trekking, mountain biking, and canoeing but you’re unlikely to come across anything more dangerous than a mosquito. In Populi, however, there’s a sanctuary where they treat injured wolves before reintroducing them back to the wild. It’s fascinating to spy on them in their natural habitat without fear of being mauled. Of course Italy is famous for its food and Abruzzo is up there with the best of them. It prizes itself on the quality of its ingredients and you can get hands on at the Abruzzo Cibus cooking school in Carunchio. 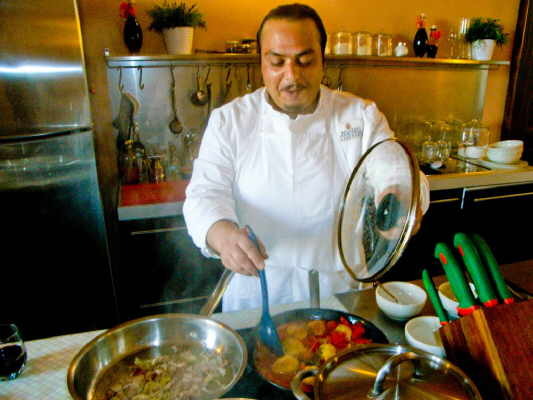 There are six luxury rooms, decorated to the highest standard, and the Palazzo has a fully equipped teaching kitchen where guests are instructed by restaurant chef Dino Paganelli and chef/teacher Cheryle Molino. Four nights here costs around 1000 Euro’s, but that does include everything. And where else can you stay in a palace and be treated like a king, even if you have to do your own cooking? Ryanair flies direct from Stansted to Pescara. 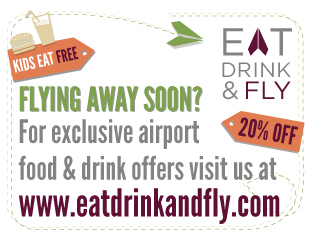 Abruzzo Turismo has great travel advice! Bradt Guide to Abruzzo is the only English language guide to the region. 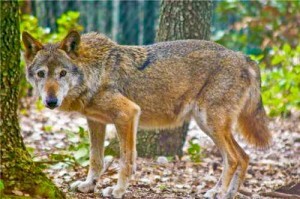 Il Bosso has information on trekking, canoeing, mountain biking and the Wolf Sanctuary.